Highway 127 is off the beaten path in most areas of the sale. And it is hot in August in the South! A cooler filled with ice cold water has come in handy more times than I can count. I buy the little 8 ounce water bottles. I fill the cooler with ice from the hotel ice machine daily. Again, you will be off the beaten path. Depending on how quickly you move through the sale, it can be a long time before you get a meal. I pack carrots, celery and grapes in the cooler as well as some pretzels, chips and granola bars. Maybe even a cookie or two. I like to travel light. I want more room in the car for treasures! But let me restate, it is HOT in the South in August. And humid, extremely humid. I made the mistake once in thinking I could wear some of the clothing I packed more than once. I was so wrong. I pretty much want to burn my clothing at the end of each day, so it goes into a separate laundry bag rather than back in the duffel bag. Some hotels have washers and dryers. As hot as it is during the day, evenings and early mornings can be chilly. I recommend packing a long sleeve shirt, windbreaker or sweatshirt. I pack sunscreen and a hat. If the sun is out, it is very intense. I find a hat to be very helpful as well. I bring a travel pack of flushable wipes to put in my backpack. Often, port-a-johns are your only option. As the sale progresses, toilet paper becomes scarce. Between touching things that a thousand other people have touched, the hot, humid weather and not being able to wash my hands after using a port-a-john, I would say this is a definite necessity! You don’t want to lose precious shopping time by being lost, do you? Hefty makes these cute little trash bags in a cute little travel case. They are the size of a plastic grocery bag (OK, I guess you could just bring grocery bags). I find it helps keep the car tidy. I recommend taking along a storage tote, or a box of some sort. It helps keep the small items corralled in the back of the car. Packing materials such as bubble wrap or newspaper are helpful to have on hand as well. If you plan on purchasing furniture, a couple of old blankets will help prevent your treasure from being scratched. These can be picked up at Wal-Mart (or any big box store) for a few dollars. 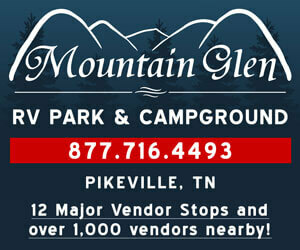 A lot of vendors are under tents and will remain open if it rains. I pack a flat head and a Phillips head screwdriver as well as an adjustable wrench. Sometimes you need to take something apart to get it into your vehicle. I have used these more than once! Sometimes you have to wrestle someone to the ground to get the item you want—just kidding! I have received a few scrapes and cuts over the years. A small first-aid kit is a good thing to have on hand. At the very least, take some bandages and anti-bacterial cleanser. Cash is the preferred method of payment on the sale. More and more vendors are taking credit cards, but cash is king! The nearest ATM machine could be miles away. I take plenty of cash in small bills. How much you should take depends on your budget. 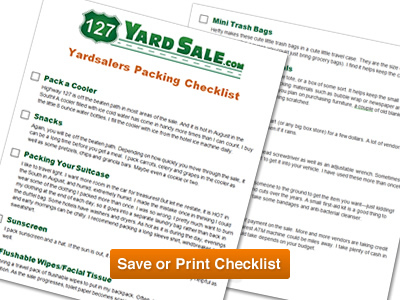 Yardsalers Packing Checklist (PDF 185KB) Save or Print this article.